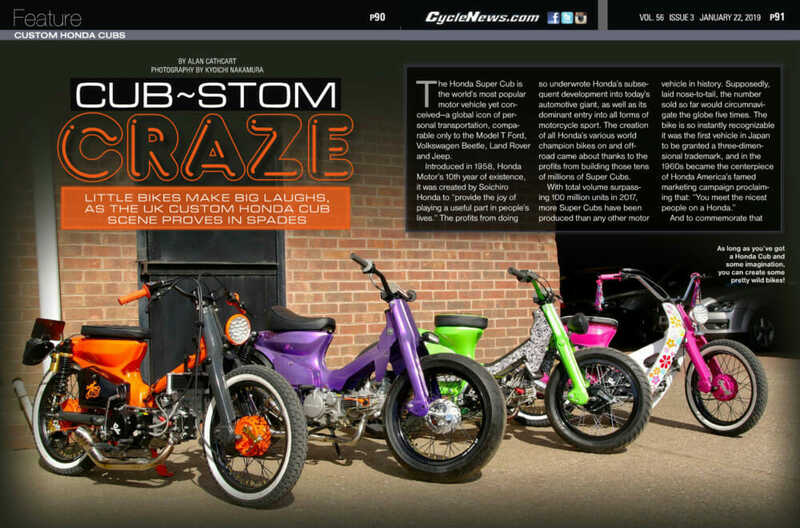 Little bikes make big laughs, as the UK custom Honda Cub scene proves in spades. As long as you’ve got Honda Cub and some imagination, you can create some pretty wild bikes! 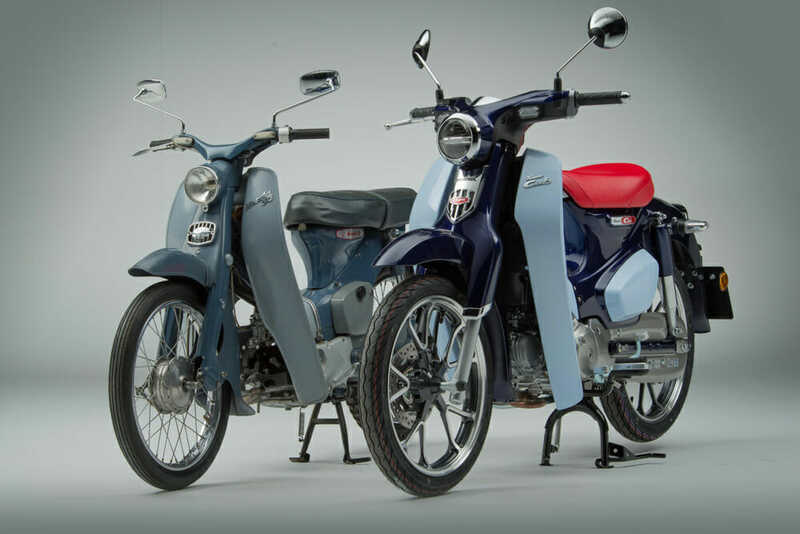 The Honda Super Cub is the world’s most popular motor vehicle yet conceived—a global icon of personal transportation, comparable only to the Model T Ford, Volkswagen Beetle, Land Rover and Jeep. Introduced in 1958, Honda Motor’s 10th year of existence, it was created by Soichiro Honda to “provide the joy of playing a useful part in people’s lives.” The profits from doing so underwrote Honda’s subsequent development into today’s automotive giant, as well as its dominant entry into all forms of motorcycle sport. The creation of all Honda’s various world champion bikes on and off-road came about thanks to the profits from building those tens of millions of Super Cubs. And to commemorate that 100 millionth Super Cub being produced in October 2017, last year Honda began producing an all-new C125 version. This retains the original’s trademark step-through underbone format and styling, still with the trademark plastic leg guards, but with a larger, more powerful fuel-injected engine, a front disc brake with ABS, a digital dash, LED lighting and a keyless ignition. 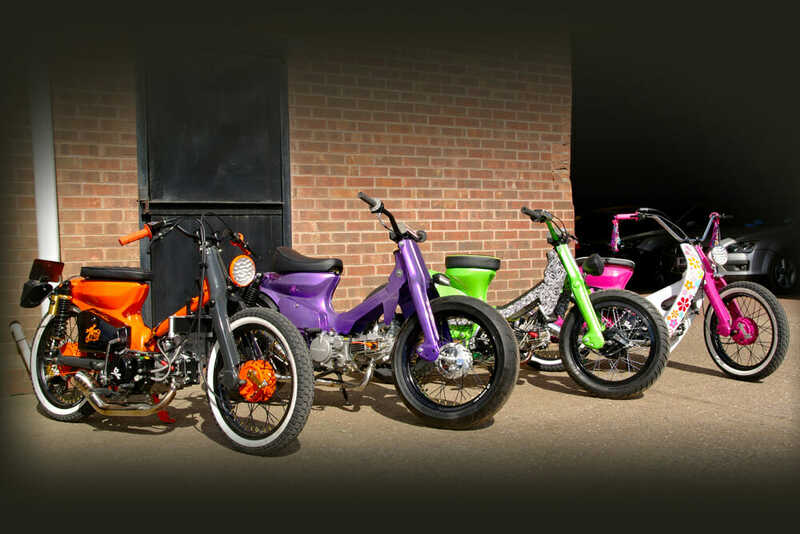 But as well as being the most-produced motor vehicle yet conceived, the Super Cub has now also become the basis for an improbable craze that’s exploding worldwide. The cult for creating Custom Cubs took off in Japan 10 years ago, and then spread like wildfire around Asia. Now it’s hitting Europe—as a chance conversation on a Triumph press riding launch with one of their test riders led me to discover. No, John Bloor hasn’t begun manufacturing a step-thru Triumph—but it transpires that two of his high-mileage test riders have a secret passion for Cub-stom Cubs—and the fact they’re married to one another inevitably means that Lee and Hayley Vigor have His and Hers models in their garage, so each can chill out aboard something completely different after a day of clocking up further mileage aboard whatever will soon be the latest and greatest from Triumph. Couples that Cub together, stay together. Quite so—but how did Lee and Hayley create His and Hers Custom Cubs? Lee built both bikes himself in 2015 over eight weeks of after-hours and weekend work, using a pair of standard C90 Super Cubs. Hayley’s pink one came in bits, while Lee’s own orange bike came off eBay complete and in running order, costing $575. Seems that’s a bargain, since prices are rising all the time, and you’d need to spend $1275 to get something comparable today—for a 25-year old 90cc runabout! Mind you, either of the customized Vigor bikes would fetch upwards of $2550 in today’s booming market for such creations. Back to the build. 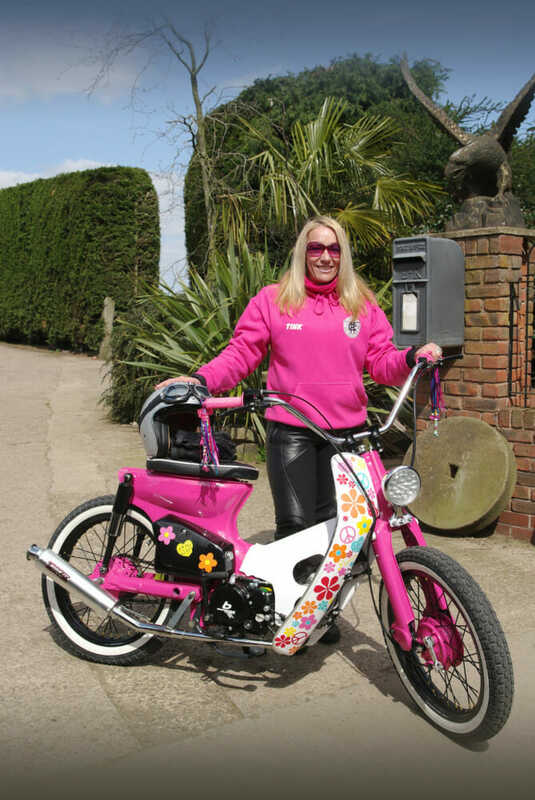 Hayley Vigor pounds our more miles than most riders around the globe as a Triumph test rider, but it’s the pink Cub she loves. 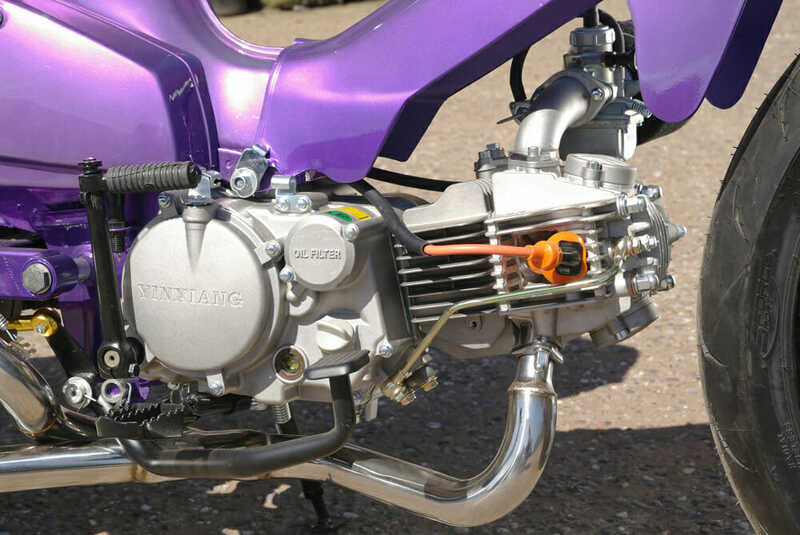 Both Vigor bikes had an engine transplant, with 150cc Motosyko Hybrid engines manufactured by Zong Ho in China but assembled in the Isle of Man installed in each bike, sourced from the Manx one-stop shop for Super Cub tuning. Triumph tester by day, Lee Vigor has been bitten hard by the Cub bug. Their YX 150 engine measuring 56 x 60mm for 148cc via an aluminum cylinder produces 15 horsepower, so exactly twice the power of the original C90 engine, with the help of a great-sounding race exhaust with an internal silencer, and comes with a four-speed gearbox, 26mm Molkt carburetor, a Digital CDI with wiring loom and Race coil pack, a dual core foam air filter, Hydro vane oil cooler with braided lines, Banjo bolts and washers, etc. Fatter Continental KKS10 WW whitewall tires sit on 17-inch Race Boy Wheels from Malaysia, incorporating the stock 150mm SLS drum brakes. 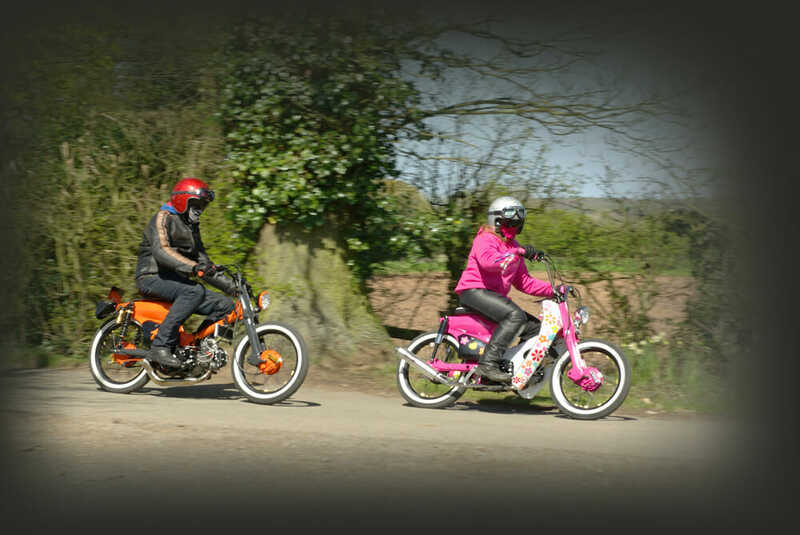 Due to his extra weight, Lee’s fitted Chinese-made higher-spec RFY shocks on his bike, which are three-way adjustable for spring preload, but new stock Super Cub shocks on Hayley’s. Adorn the result with a host of accessories and stickers—I liked the “Built not Bought” one on Lee’s bike—and the result is two pieces of practical and affordable motorcycle art just like the other tens of thousands of such bikes now being concocted worldwide. Cheap Chinese motors offer twice the power of the regular Cub 150 motors and are surprisingly sturdy. 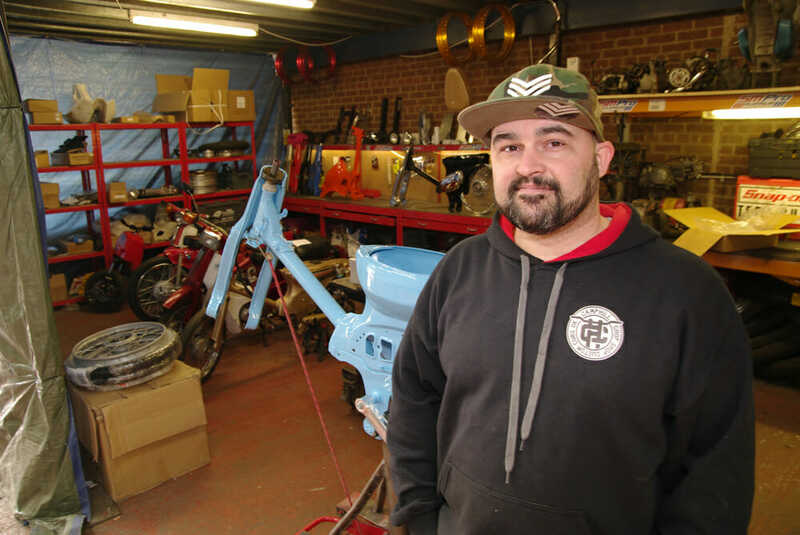 What went from a quick Facebook search turned into a full life change for James Gibson and his new business, Camp Hill Chop Shop. James Gibson, aka Gibbo, is the man who inspired this fast-growing Custom craze in the UK. Camp Hill Customs has a shop stuffed full of Honda Super Cubs in various stages of undress. 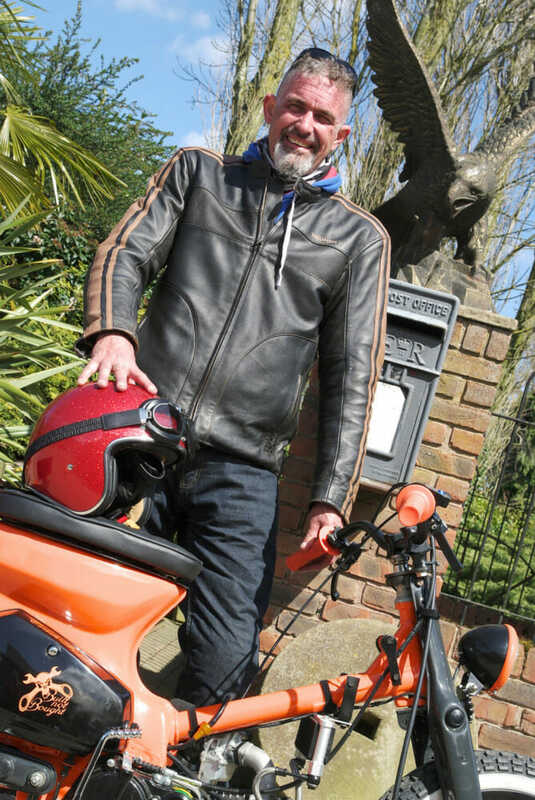 “I had a standard C90 Super Cub sitting in my garage doing nothing,” explains Gibbo, 36. “I thought I’d clean it up to sell it, so I went on to Facebook to look for parts, and somebody shared a Malaysian Street Cub group on there. I was stunned at what they had—big wheels, big engines, heaps of accessories, nothing I’d ever seen before. They’re creating two-wheeled works of art more or less freehand, with a grinder in one hand and a welder in the other, seemingly making it up as they go along. How cool is that?! 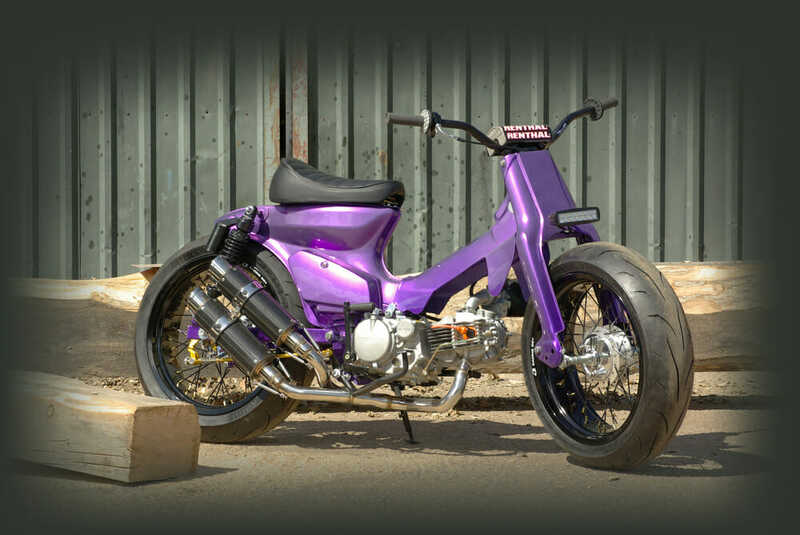 Supermoto wheels, no front brake, deep purple paint, what’s not to love?